April so far has been a real mix of weathers here in the UK, and in our corner of west Norfolk, we've been enjoying some beautiful sunshine and real warmth (when you're standing in the sun!) along with real chill, and plenty of rain. In fact we had heavy sleet yesterday and some folks even got snow! So we aren't out of the woods yet. However, it has been good enough to galvanise us into really making big changes in the garden. What used to be a damp dark bottom corner, where Jim's "Fishing Lodge" i.e. man shed, was, along with a thick hedge and fence, has now been opened up and is a very sunny spot now. How about that white picket fence? I painted that; I thought it would be good to have a visual separation between the top garden and the bottom bit where all the work is going on now. An over-all view of what I'm calling the pottager (for want of a better word!) showing the large cold frame and the raised beds Jim built. Right at the bottom is my little Square Foot Garden which started everything. Jim had been very reluctant to use raised beds, as our garden soil is brilliant - it's been dug over and nurtured for over 20 years by him, with no nasty pesticides or fertilisers, other than our own home made compost and regular feeds with comfrey juice he makes in a large bucket from the comfrey plants he grows. However, reading more about the raised bed system, and acknowledging that the soil wouldn't be wasted, convinced him that we could probably try it, and he set to in his usual manner, and quickly made up the brick bed and the two wooden raised beds, also building the large cold frame which replaces the small greenhouse, given away when we were preparing the ground for the summer house. In the brick bed, I've got three red-veined sorrel plants, rows of radish, rocket and spinach. Later this month or in May I shall put fennel bulbs in the remaining space. I've got a variety of salad leaves growing in those small troughs. Here in this wooden bed, I've planted long stem broccoli and red cabbage. At the bottom of the bed we made a trellis and I planted two outdoor variety cucumbers which I hope will scramble up the trellis. The view from the garage looking up the garden. In my square foot garden I've sown Chard Bright Lights and White Chard, red beetroot and beetroot chioggia, which has red and white concentric rings. Also in this bed are spring onions and lambs lettuce. To the right you can just see the four sacks containing early new potatoes. Much simpler planting them in sacks and they take up much less room too. In the second wooden bed, I've got some shallots and some red onions, and at this end I shall plant some squash which I'm growing from seed in the cold frame at the moment. I've no idea how the squash will do… but until you try you never do know! The cold frame has all sorts of seedlings coming up - chives, parsley, coriander, nasturtiums, anemones, stock…other flowers… and some veggie seeds I can't remember what Jim sowed! We probably get as much in here as we did in the green house, and the tomatoes are in a covered planter just to the left of this photo. In December 2014 I was saying "all I want for Christmas is a potting shed!" well, I never did get one, and we have no room for one but I DID get a potting table yesterday! We painted it and here it is in its glory - I love it! Don't laugh at my dinky trowel and fork… I love the colours! On the right-hand side of the garden you can just see where Jim has planted some cauliflowers and round -head cabbage. How about my pink planter, hey? This used to be a white tray set-up I used initially for my craft fairs, but it was never a very good idea and I abandoned it. So I painted it pink - Jim just raised an eyebrow when I told him my intentions, but he does now agree it looks fine against the sage green summer house wall. Here I have lavender and a load of herbs waiting to go in….. somewhere else….more of which another time! 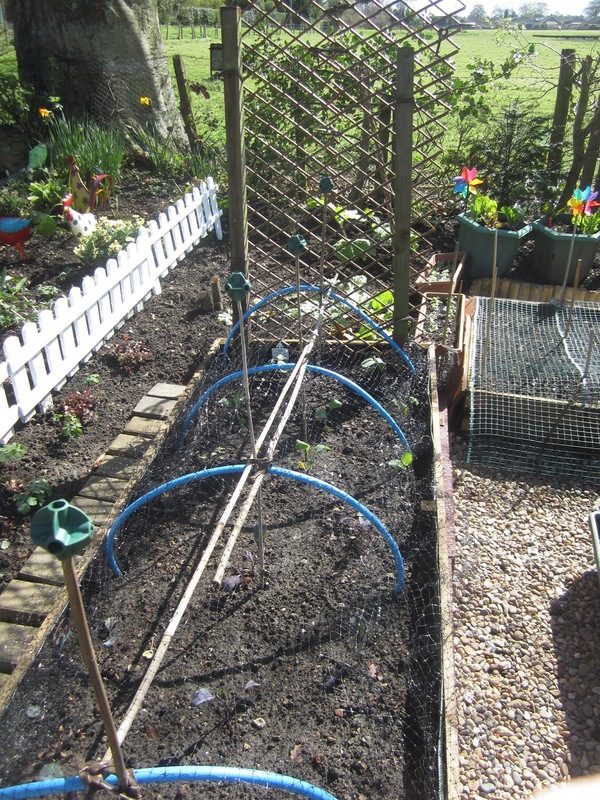 Beyond the covered caulis and cabbage Jim has prepared the veggie garden for further sowing and planting. Up on the patio I dumped these uprooted muscari (grape hyacinth) which I moved out of the old sink planter from the rockery area just outside the window. This sink had become totally overrun by muscari. There are a few tulips, violets and ground cover plants which I can't remember the names of; they've been there for so long! 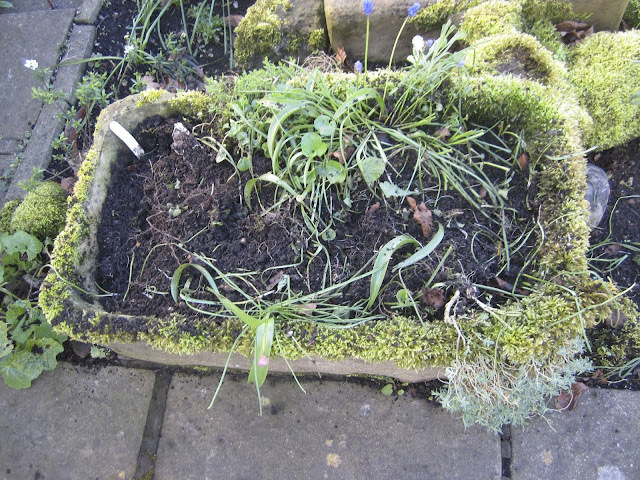 I'm going to replant the muscari in the two tiny strips of soil we laughingly call the front garden. We have many more plans for the garden, some of them quite revolutionary, by our standards. But it all takes time. I am amazing myself with this new -found enthusiasm for actually getting into the garden and getting my hands dirty, as opposed to footling around with my herbs and doing little else out there. I think I always felt the garden wasn't my place. Not that Jim was possessive about it, but it was always just a place where the veggies got grown, and I just used the patio and grew a few herbs. Since the com ing of the summer house we have revised our ideas of what the garden should be, and Jim has encouraged me to really get out there and garden. I know by the standards of my long-time gardening friends, and those who have gone even further and rented allotments, and installed polytunnels, we do very little, but everything you can grow for yourself is a step away from reliance upon an increasingly and worryingly prescriptive food industry. Also, we need to sow and plant and confound the plans for the global seed industries who are even now trying to force through legislation forbidding us to save and share seeds. You couldn't make it up, and I'm not. There are states in America where they are forbidden to save their rainwater. If any of my American readers can enlighten me as to the reasoning behind this I'd be grateful ! The so-called 'doomsday seeds' are not a conspiracy theory construct, Monsanto and other GM producing seed companies intend that their seeds are purchased which will mean that they will have to continue to be purchased as they are one-offs, you can't save seed from these crops, they are sterile. Hence eternal reliance on these mega companies. And they market themselves as the saviours of the Third World poverty problem! Anyway, continue to do your bit and enjoy all the other benefits working in the garden brings to you! I'm loving it! Must go, that muscari won't plant itself! Ha! Jayne, I couldn't have a garden with no colour now could I? I bought the pinwheels to keep (hopefully) the pigeons off the new leaves, preferring them to strings of old CDs glinting in the sunshine. OK, garden purist will be shuddering, delicately, but hey, it's my patch! I love it! We use the summer house very day the sun shines enough to warm the garden. So green, and sooooo ready to grow ;-)) ! Yours looks so productive... nice to have a division between the areas isn't it. We've got mixed hedging forming a nice screen/boundary across most of the garden, as you may remember from when you visited? And I used a childs hand gardening set as it was easiest! Plus, as you say, the colours are much cheerier than proper, grown up stuff! Do you think your enthusiasm stems from having lost weight? Hmmm, I don't know Edwina, but for sure, positive thoughts beget more positive thoughts, so who knows? I've become very interested in the need for taking on a little of our own food production (very little in fact) I think we all need to be standing up to the Big Boys who are intent on holding the means to food production in their hands alone. The current swing towards a bit of self-sufficiency should send a shot over their bows! Monsanto - get over yourself! Can't wait to see it all in "full bloom". The best kind of happy work. That lovely little shed sets it all right. Hello Sweet Lynne, Your garden space is wonderful. I love that it has a whimsy about it . . . Now, tell me, do the whirligigs keep the birds away, or are they just there for color and cutest? I am very impressed with your cold frame. I think that I might need to build one of them. I cannot believe how fast my little green house is filling up. Have a lovely week and happy gardening. Loving your garden and it's colourful accents until the veggies/herbs/flowers kick in. Wonderful post, full of the joys of Spring and MY!! how busy you have been and there are great results from your labours. So many individual touches too. Thought of you at the weekend when we chanced upon the Sweeps Festival in Rochester. Over 60 Morris sides there and the atmosphere was amazingly vibrant. I looked around and checked the schedule incase the Mollys were there. It would have been fun popping up in front of you to say "Hello". Take a peek at my post as you may well know some of the people as the sides were from all over England. Gosh April has been a busy month and your garden is looking really good. Love your summer house colour too.